Holi is a Sanskrit word which is also known as Spring Festival and sometimes, also referred to as the Festival of Love. This isn’t a new thing. Every religion, every culture has countless such examples where evil has always lost in the end. But, the idea is, it is yet another reminder that comes to us each year so we do not get distracted while life keeps luring us with glittering temptations to violate integrity for small temporary gains. Holi reminds us that, although the path of truth and honesty might look difficult, its rewards are worth it. We must not forget that with God, everything is possible and so we must remain truthful. Holi is a time of the year when people come together to clean their houses, streets, collect dry wood for Holika bonfire and then play together with colors leaving all their worries behind. It is also a time of the year when people don’t care about cast and creed, religion when celebrations begin. Families come together, friends gather and they renew those dusted relationships. 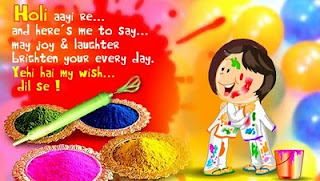 Holi gives us to forgive even our enemies and play with them, celebrate with them and make friends with them. It isn’t easy, but that is why Holi is such an special occasion. There are numerous examples and stories of enemies who became friends after they celebrated one Holi together. Can you imagine how beautiful life will be if we can take this message to our hearts and begin each day with the same love and feeling of enthusiasm towards others? Holika bonfire symbolizes an opportunity to burn all that is evil in us. People collect all the junk and put that into the bonfire that evening symbolizing that they are burning all that is evil in their lives. Isn’t that a great way to start fresh? Imagine the beauty of our souls when we can do a fresh start leaving all that was bad, all that was dark in us behind and moving forward fresh like a clean slate. Just love the thought of it makes me feel fresh right now as I write this. Finally – and the most important of all – is to live by the golden rule. We put colors on others and enjoy when others put colors on us. The real enjoyment comes when we see happiness in other people’s eyes when they put colors on us. This is such an amazing experience! Small or big, rich or poor, everybody treats the other person with love and respect that day. Holi teaches us the lesson of caring for others, making others happy and sharing our joys with them for that one day at the very minimum. Can you imagine the beauty if we all could spend our everyday with the same love for others, the same sense of responsibility and respect for others? Our lives will be enriched with harmony making our societies peaceful with happiness all around us. As we celebrate Holi on March 24th this year, let’s not just make it just another day to party and have fun. Let’s take some of the life lessons Holi teaches us and enrich our lives with love, harmony and peace. May God’s blessing be on everyone for ever.